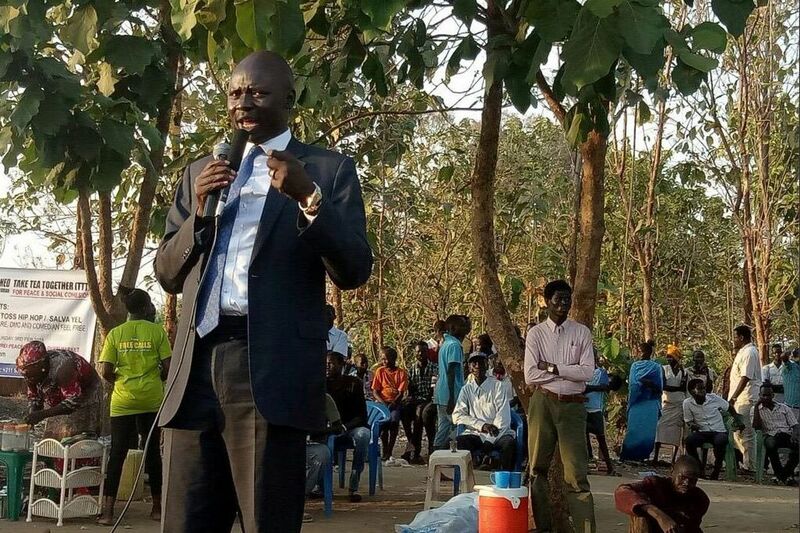 Peter Biar Ajak in Juba, South Sudan, in February, attending a community event dubbed "Take Tea Together," a local forum aimed at promoting peace among young people in South Sudan. Peter Biar Ajak was 16 when he stepped off a plane in Philadelphia in January 2001, one of 40,000 "Lost Boys" left homeless by the violence and brutality of civil war in Sudan. Everything he owned he held in his hands: a manila envelope containing a chest X-ray that proved he did not carry tuberculosis and a sheaf of immigration papers declaring him a refugee who was permitted to live and work in the United States. His shoes were so ragged, said Dale Long, the resettlement volunteer who met Ajak at the airport, that their first stop was Wal-Mart to buy the teen a new pair of sneakers, size 13. Today Ajak, 34, has been transformed, dressing in dark, bespoke suits, a sophisticated international economist and activist — and, since July 28, the focus of worldwide demands for his freedom from a notorious South Sudan prison. A critic of his country's repressive regime, Ajak was arrested by national security forces as he boarded a plane in Juba, the capital, to attend a youth conference. He is being held without charges and may be in solitary confinement, according to human-rights groups. Friends, colleagues and Western government officials fear for a man who ranks among the foremost scholars and speakers on South Sudan, educated at Harvard and Cambridge Universities, traveling the globe from his home in neighboring Kenya to confer with presidents and diplomats. A month before his arrest, Ajak was in Belgium to receive a New Leader for Tomorrow award from the Crans Montana Forum, a Swiss organization that promotes high-level dialogues. But before he earned a world-class education, before he joined the World Bank as an East Africa expert, before his views and insights were sought by CNN, the BBC and the New York Times, Philadelphia was his home and launching pad, the place that nurtured his persona and helped shape his thinking. In a rowhouse in South Philadelphia, at Central High School and La Salle University, friends said, Ajak's charisma blossomed, his ideas expanded, and his Christian faith deepened. Here he turned toward a new future for himself and South Sudan. "Peter is not some naive idealist," said Christopher Schwartz, a La Salle classmate who is now a journalist working in Central Asia. "He's a man deeply and spiritually committed to the betterment of humanity, and is determined to contribute to that betterment by developing his homeland, at great personal risk." Peter Biar Ajak, age 16, pictured soon after his arrival in Philadelphia in 2001, wearing his new pair of sneakers, size 13. In the early 2000s, the U.S. agreed to accept and resettle about 4,000 Lost Boys, the nickname for the legions displaced or orphaned during what became known as the Second Sudanese Civil War. Ajak's hometown had disappeared in flames as he and others in the Christian south fled the Khartoum-based government of the Muslim north. He trekked hundreds of miles by foot, from Sudan to Ethiopia in 1989, then back through Sudan to Kenya in 1992. After coming to Philadelphia, he described his years of terror, running and wandering this way: People died. All around him, all the time. They died from chicken pox, measles, malaria, cholera, dysentery, and typhoid. They died from starvation. They died when weakness made them prey for lions and leopards. They died when warring tribes or political factions came in the night and shot everyone they could find. Official accounts estimate that two million died between 1985 and 2005. Ajak was living in a refugee camp in Kenya when he was among the boys chosen by the United Nations High Commissioner for Refugees and the U.S. government to come to America. Resettlement services assigned Ajak and two other youths to live with Long at his Sixth and Kimball Streets home, not far from the Italian Market. "You wouldn't believe how bright this kid was," Long said. "Early on, I knew this is a guy with a future." Ajak enrolled at Furness High School — and hated it. He couldn't believe how students disrespected the teachers, interrupting in class and throwing things in the halls. There was something else, too: He was ridiculed by his classmates, wounding him deeply. The Dinka people, who with the Nuer comprise Sudan's two largest ethnic groups, can be extremely tall. The late 76ers center Manute Bol, who stood 7-foot-7, was Dinka. Ajak loomed over other students at 6-foot-5, and they mocked him for it, and for his uncertainty over American ways. "Go back to Africa," kids taunted him. Mary Yee, the veteran Chinatown activist, knew Ajak through the Newcomer Center she helped run in South Philadelphia. She approached Central High School president Sheldon Pavel, who agreed to admit Ajak. The youth tore into a broad menu of studies, from Greek theater to algebra to Chaucer to Plato. "Peter was a very bright young man, a very athletic young man, and we all thought he would, in fact, be heard from in a very positive way," said Pavel, who is now retired. Ajak graduated from Central as an honor-roll student in 2003. Peter Biar Ajak (left, leaning) with friends outside the South Philadelphia rowhouse where he lived. The youths were celebrating their high school graduation with Dale Long. From left are Ajak, Long, Garang “Marko” Kwach and Amos Achuil. La Salle was easier, at least socially. Ajak found a group of friends, all brainy and philosophical, all focused on rising in academia, business and politics. His charm shone. "He could really get along with anybody," said classmate Anthony Delcollo, now a Delaware state senator. La Salle encouraged students to embrace the school nickname, Explorers. Ajak exemplified it, Delcollo said, signing up for outside seminars and programs and becoming involved in campus political and economic associations. He didn't talk much about his time as a Lost Boy. Ajak was unusually lucky in that his parents also survived, but his suffering was enormous. "I think he was still processing his feelings," classmate Schwartz said. "But even then, he seemed to have already resolved that what happened to him was transformative and demanded a clear moral perspective on the world." Ajak excelled at La Salle and in 2007 donned cap and gown to proudly accept his bachelor's degree in economics and international studies. "There are all kinds of opportunities here to change your life," he told the Inquirer at the time. "Some of my friends look at it as a matter of chance, but I thank God, because there was a 99 percent chance that I would never have been here." As he grew, he faced internal struggles. Ajak hailed from a prominent southern Sudanese family, and while the civil war had disrupted some hierarchies of class and religion, expectations remained. Ajak labored to envision a path, friends said, where he could help build his homeland without descending into its ruthless politics. He found that route in activism, in working to better the lives of all South Sudanese, they said. In 2009, Ajak earned a master's in international relations at Harvard. As he prepared to pursue a doctorate at Cambridge University in England, he was telling people he would return to the land he had fled. Two years later, the civil war ended in what looked like success, producing an independent South Sudan, population 13 million. But new violence broke out in 2013. And famine followed. Peter Biar Ajak, outside the South Philadelphia rowhouse where he lived upon coming to Philadelphia. The house belonged to Dale Long, a resettlement volunteer. Today, hopes for development and stability have vanished as the government "unleashed a kind of terror on our own citizens which would shock the likes of Idi Amin," former vice presidential press secretary David Mayen Dengdit wrote on an African news website in a reference to the former Ugandan dictator. Ajak called for a new, peaceful generation of young leaders to rise and run South Sudan, critical of how President Salva Kiir and former-deputy-turned-rebel-leader Riek Machar have conducted peace talks. The two signed a power-sharing arrangement last week; a similar deal fell apart in 2016. "We can no longer watch the mess going on in our country without doing anything!" Ajak wrote on Facebook two weeks before his arrest. He is being held at the headquarters of the South Sudan National Security Service, known as the Blue House because of its tinted windows. Political prisoners there can face starvation or death, and Amnesty International has documented cases of detainees being tortured with knives and beaten with bamboo sticks. Some simply disappear. People worry that could happen to Ajak. Five U.S. senators have called for his release. The Juba heads of mission for the U.S., Canada, France, Germany, Norway, Sweden and other nations told the South Sudanese government to release Ajak or charge him. More than 14,000 people have signed a petition on change.org, and supporters are running social media campaigns under the #FreePeterBiar hashtag and at @FreePeterBiar. Ajak could have stayed out of South Sudan, friends said, and offered his voice from London or another safe location. He knew the risk. And went anyway. "They can throw you in a dark room, and you may never be heard from again," Delcollo said. "He nonetheless said, 'I'm going to criticize the violence, and I'm going to stand up for the right thing.'"